Manchester mummy 1770 is one of the few mummies to have been unwrapped and studied in recent times using a range of biomedical techniques. 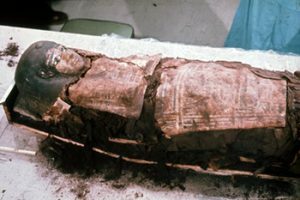 Her autopsy in 1975 and the subsequent research that has been carried out on mummy 1770 over the last forty years have provided a unique education resource that is unlikely to be replicated again in the UK. There has also been considerable, growing debate in recent years surrounding the retention, display and study of human remains. We intend to explore this subject, using the autopsy of Manchester mummy 1770 as a case study. An accessible online open educational resource (OER) is available that promotes interest in, and understanding of, the scientific study of ancient human remains. A major aim of the project is to allow free, public access to all of the data produced by a mummy investigation project through an online repository. 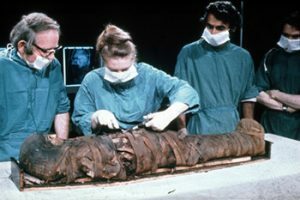 In doing so, the unique archival resource generated by the unwrapping and study of an ancient Egyptian mummy will be preserved for future generations. The project will examine the techniques used to study human remains, what can be learnt about the health and disease of individuals and ancient populations using these techniques and how such studies are evolving in response to scientific advances. The changing attitudes towards the ethics of such studies will also be explored using a diverse range of resources. The educational materials produced to support users throughout the resource will be developed with input from a range of interested groups and volunteers, allowing the resource to be shaped in response to the needs of its audience, producing a core around which a community of learners can be built. As the project progresses, resources will be added that can be accessed from this website. If you would like to be added to our mailing list for updates or if you are interested in being a volunteer on the project please contact jenefer.cockitt@manchester.ac.uk.